In Florida, an atheist created a case against the upcoming Easter and Passover Holy days. He hired an attorney to bring a discrimination case against Christians and Jews and observances of their holy days. The argument was that it was unfair that atheists had no such recognized days. The case was brought before a judge. After listening to the passionate presentation by the lawyer, the judge banged his gavel declaring,"Case dismissed!" The lawyer immediately stood objecting to the ruling saying, "Your honor, How can you possibly dismiss this case? The Christians have Christmas, Easter and others. The Jews have Passover, Yom Kippur and Hanukkah, yet my client and all other atheists have no such holidays.."
The judge leaned forward in his chair saying, "But you do. Your client, counsel, is woefully ignorant." The lawyer said, "Your Honor, we are unaware of any special observance or holiday for atheists.."
The judge said, "The calendar says April 1st is April Fools Day. Psalm 14:1 states, 'The fool says in his heart, there is no God.' Thus, it is the opinion of this court, that, if your client says there is no God, then he is a fool. Therefore, April 1st is his day. Court is adjourned." You gotta love a Judge that knows his scripture! I stole this from my friends blog. I have no idea if it's actually true, but I believe it is! I don't know what you want to actually call them... but yummy they are! I had a few peanut butter chips that I needed to use up... ok, that's a lie, wanted to use is more like it! I found a recipe that used Peanut Butter Chips, Crisco and Corn Flakes. Well, I didn't have any Corn Flakes, so I decided to make them with Rice Krispies instead. So, I started melting the Crisco and Peanut Butter Chips, but it didn't really make a nice creamy mixture that would coat cereal very well... so then I just started throwing things in. What ended up in the pot you ask? Rice Krispies (I just poured in enough to use up the melty mixture, but I'd guess it was 3-4 cups, but it could have been 5-6 too! After it was all mixed together, I added a baker's bag of mini Reece's Pieces. Scoop and cool! I used an ice cream scooper, so it could pack everything together, but I bet this would be a fun project to do with kiddos too, and let them press them into cookie cutters or roll them into balls. We received the sad news that Bobby's Mamaw Sturdivant passed away on Easter morning. We decided that we'd leave on Monday to drive down there to be with the family and for the funeral. Grandma Thole getting her last bit of cuddling in before we left for the week. 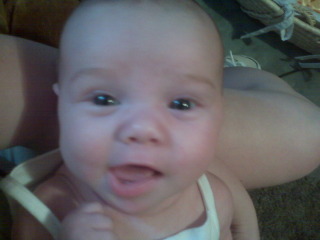 Kaygan and her cousin Anna's little boy Weston. He's 5 months here and she's almost 2 months here! They seemed to get along pretty good... Kaygan didn't even mind when Weston 'fishhooked' her! This is Bobby's sister Kim! Anna and Kaygan again... Anna is Kim's daughter! 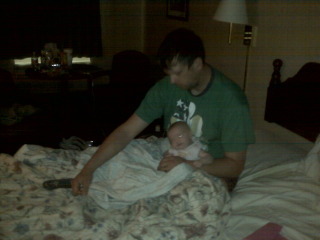 Kaygan talking with her Mamaw and Papa Stell before we left to go back home. It was nice to get to visit with Bobby's family, even if the reason we were all together was sad. I've added a few videos from today for your viewing pleasure! Enjoy the cuteness! 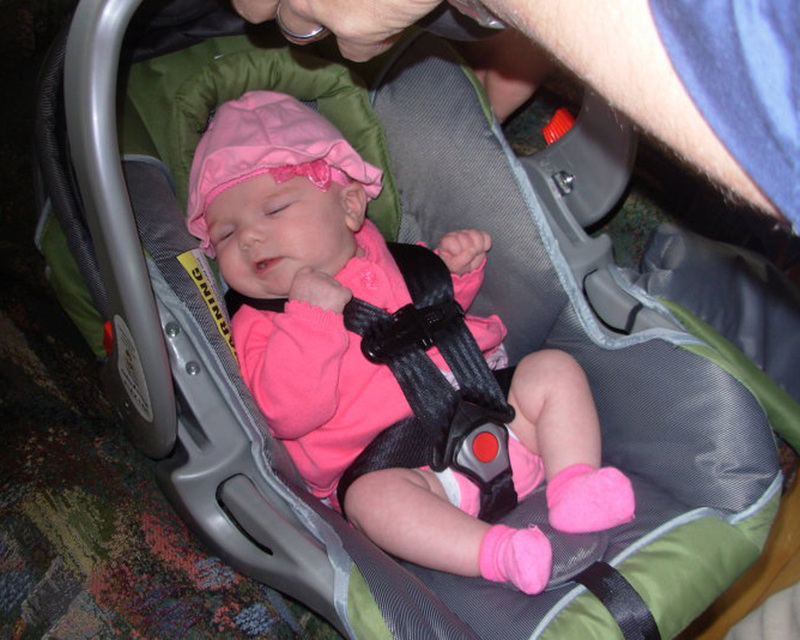 Here's Bobby getting ready to put her in the carseat. No matter how big I think she's getting, as soon as I see him holding her, she seems smaller! 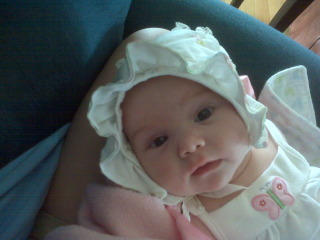 Yeah, I only wanted the bow on for church, but it was a bit chilly, so we did a hat with the bow till we got to church. So, I was a little sneaky and put whipped cream on Paul's glasses while he was napping. 4 generations of Ladies here. Grandma had a beverage spill, so we put her in her hubby's clothes for the rest of the afternoon! I personally think she's cute! 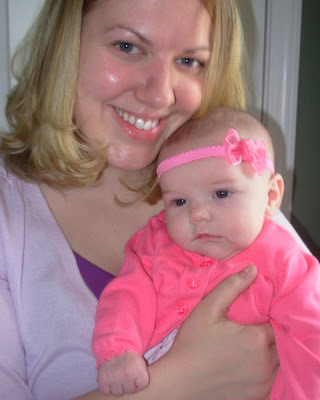 Kaygan and one of her Great Aunt Suzis... she has one on the Thole side and one on the Stell side! 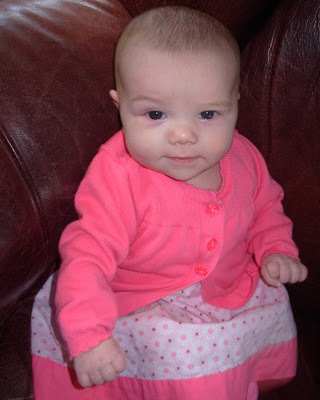 And here are just a bunch of her in all of her cuteness! Cuddling with her Easter Basket! Bobby gave her the purple bunny, and I gave her the caterpillar. Sleeping while eating... don't we all wish we could live that comfortably? 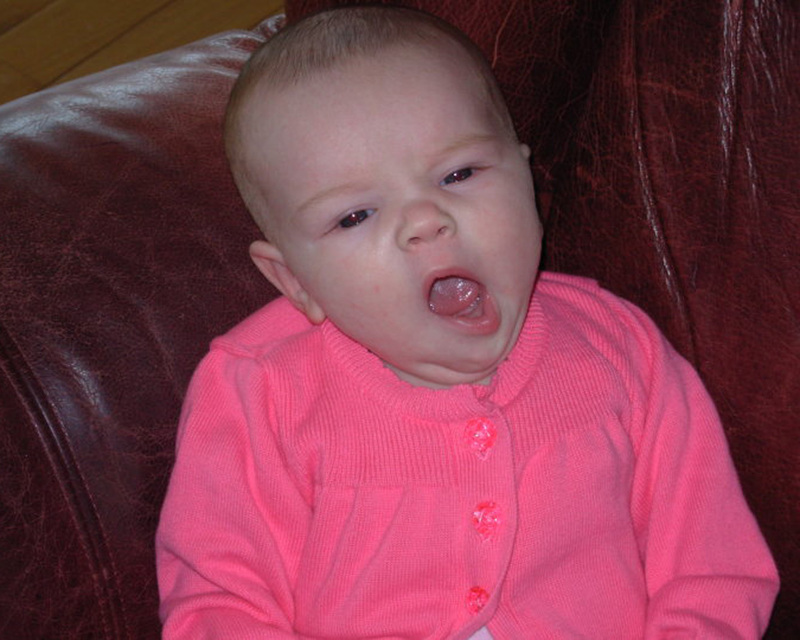 So tired... it was a long day! 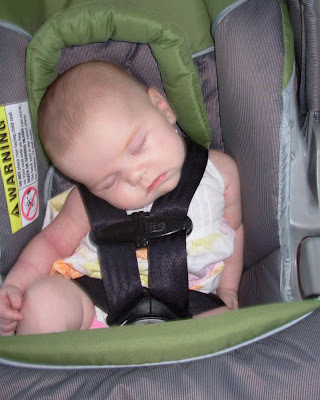 Aunt Becky took some pics with her camera, so I had to post them! In her carseat after a trip to Cape, seriously, how are they comfortable like this! I love my OB! So, I just had to give him and his office a 'Shout Out' for their awesome staff! 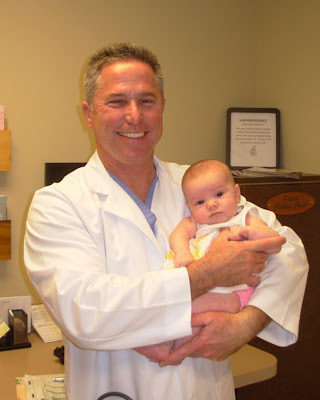 Dr. Morton practices at Women First in Cape Girardeau, MO. He was so awesome! He was also my OB for Taylor, and after we lost him/her, we couldn't imagine using another OB. He was very compassionate about our loss, and even took the time to ask how I was doing emotionally. It was nice that he didn't only care about my physical well-being. So, here he is after our 30 minute "Tug O War" with Kaygan. Once it started to look like there might be trouble for us, he was there almost immediately! He talked to me when they were trying to get Kaygan to cry and she couldn't, and he really calmed me down. He left right after she'd squacked a few times, and he thought she was fine, so he was really surprised when he came in the next morning to check on me that she wasn't fine and was in the NICU. 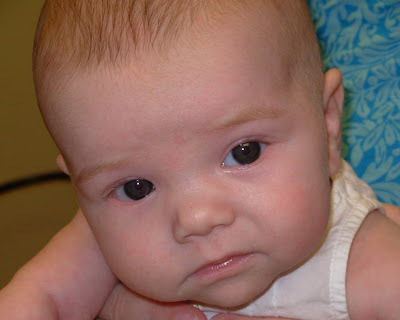 He again was compassionate and talked to us about the emotional stress of having a NICU baby. 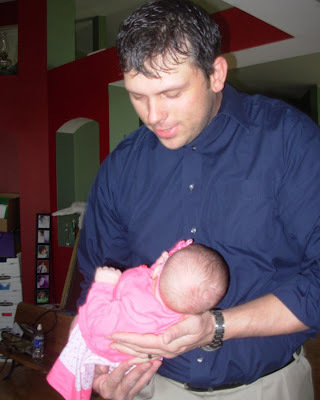 He then decided to have some additional tests run on the equipment used during my labor and her birth to rule out bacteria on them. I was very impressed with his follow-up! 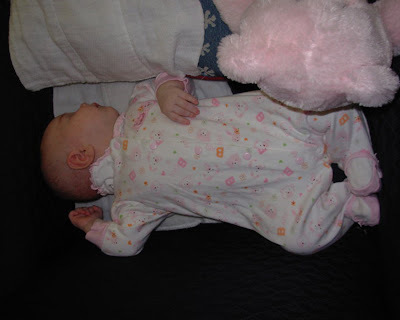 Because of her NICU stay, we didn't get to take a picture of her with him while we were still in the hospital, so, I took one when I went back for my 6 week check-up. After my 6 week check-up, he congratulated me one more time and I told him "see ya for the next one"! These are in March, but I didn't want to NOT post them! 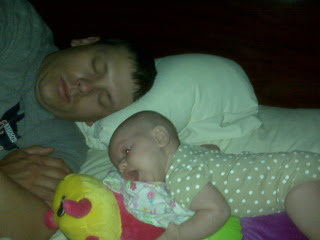 Kaygan and her daddy takin a nap! My dad brought this coat home for Bobby as a joke. Dad told Bobby that he'd spent $$ to get him a trench coat, because he thought it would be a nice winter over coat for him. He was totally joking, but Bobby wasn't sure if he was or not, so he tried to play it off polite and grateful until he saw the rest of us laughing our heads off! 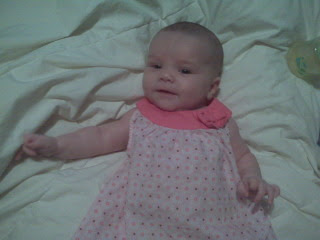 So, I told Daddy to dress her today... so he did. Well, first, he put the Huskers onsie on her, then she spit up all over that, so I sent him to change her again, and this is what she got! Here's a video from tonight, April 14, 2010. 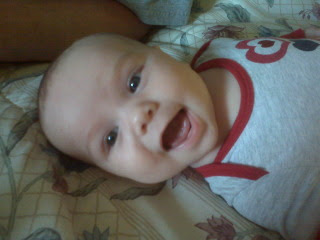 Kaygan is exactly 8 weeks old! 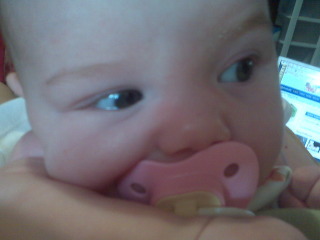 She does this 'baby bird' thing. Any time we grab the corners of her mouth and push them up into a smile, she pops her mouth wide open! EVERY TIME... seriously, it makes me laugh SO hard! I should add, that's Aunt Bex talking to her! 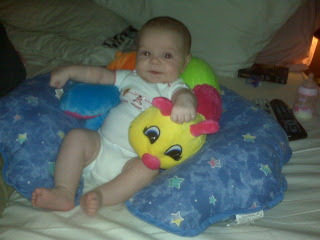 Kaygan Loves the Biggest Loser! Yes, Kaygan was sitting on Aunt Becky's lap last week watch The Biggest Loser on Becky's computer. Kaygan was totally enthralled! 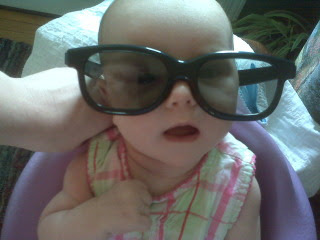 I know that it's 'bad' for babies to watch too much TV, but just a bit can't do too much damage! So, I said in my last post that I was going to keep up with those mobile photos... but, we had some unforseen travel that delayed it... I'll explain in another post, but, here's all the phone photos from the past week. And yes, there is alot, it's amazing how many photos you want to take of your own baby! 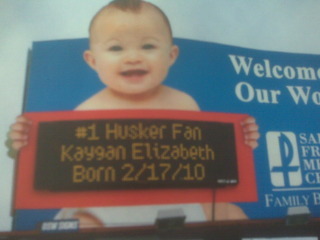 Here's her name on the Hospital billboard! 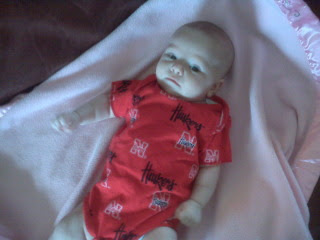 And her outfit to prove that she really is a Husker Fan! 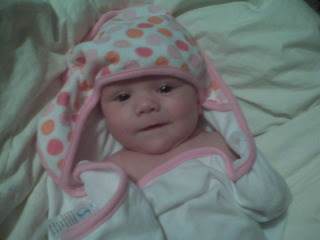 This was my bonnet when I was a baby! 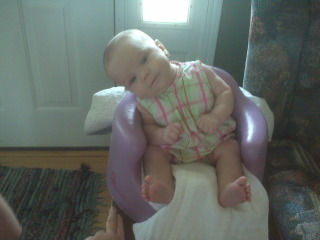 She and I were just having a fabulous conversation here... she's really starting to chatter alot! Hanging out with her Pass. Easter Morning! 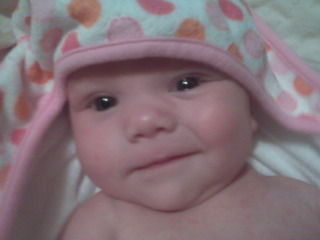 Fresh out of the bath! 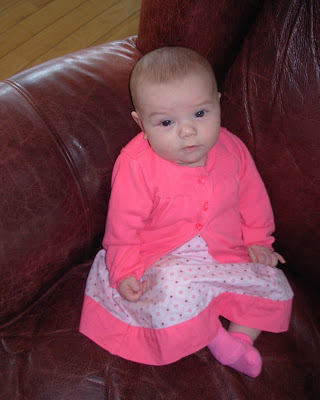 Looking quite cute (If I may say) in her Easter Outfit! Hangin out... I think we were getting ready to leave for Arkansas. Hanging out in our motel room. She was asleep when I went to grab my phone, but woke up before I could take a picture! 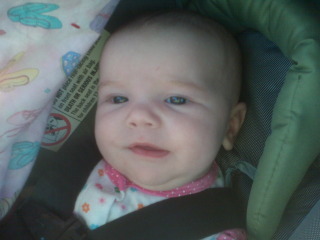 Cheerful and ready to see her Mamaw and Papa! 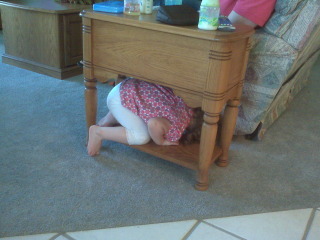 Kailey was looking for a place to take a nap. Apparently under the end table seemed like a good place! On our way back to Missouri! 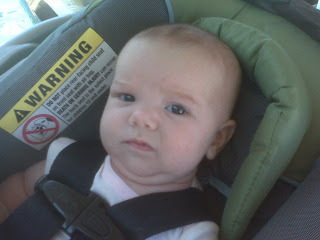 Still on our way back to Missouri, but with a new outfit... as we got the other one quite dirty with a diaper blow out! 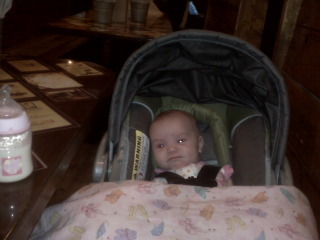 First trip to Lamberts. 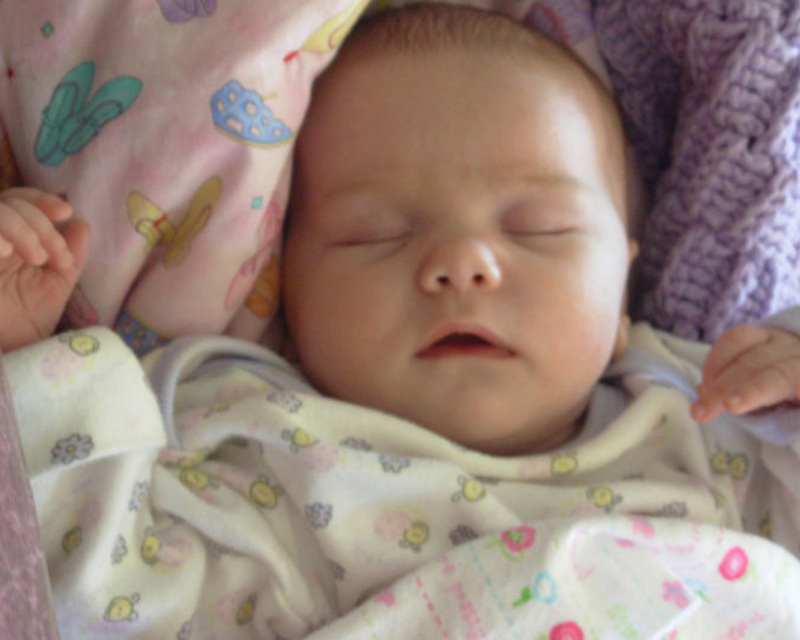 She slept through most of our time there, even with the roll throwers yelling right above her head! 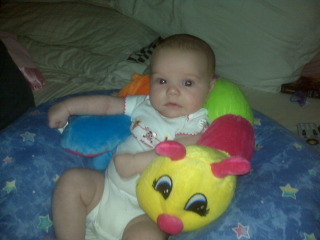 Using the caterpillar from her Easter basket to help her sit up. Thanks for looking! There will be more coming as soon as I dump my camera card!